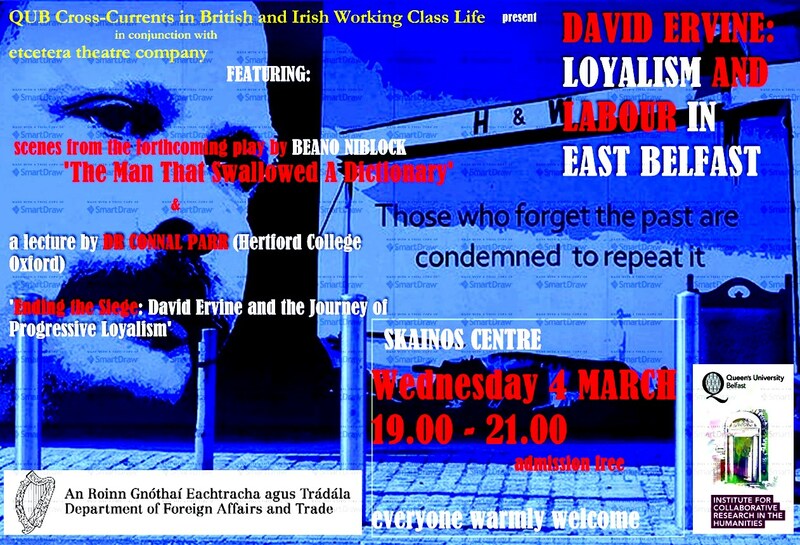 The QUB Institute for Collaborative Research in the Humanities in conjunction with etecetera theatre company and the Department of Foreign Affairs and Trade are hosting ‘David Ervine: Loyalism and Labour in East Belfast’. The event which will be held in the Skainos Centre on Wednesday 4 March at 7.00 pm is the latest in a series of events which critically engage with working-class culture, community and politics. The evening will feature a lecture by Dr Connal Parr (Hertford College Oxford) entitled ‘Ending the Siege: David Ervine and the Journey of Progressive Loyalism’. The lecture will be complimented by scenes from Robert ‘Beano’ Niblock‘s forthcoming play about David Ervine entitled ‘The Man That Swallowed A Dictionary’. 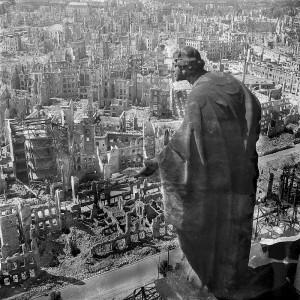 The Bombing of Dresden city in Germany took place in the final months of the Second World War. In four raids between 13 and 15 February 1945, 722 heavy bombers of the RAF and 527 of the USAAF dropped over 3,900 tons of high-explosive bombs and incendiary devices on the city. The bombing and the resulting firestorm destroyed 8 square miles of the city centre. It is estimated between 22,700 and 25,000 people were killed. Three more USAAF air raids followed, two occurring on 2 March and 17 April aimed at the city’s railroad marshaling yard and one small raid on 17 April aimed at industrial areas. Post-war discussion of whether or not the attacks were justified has led to the bombing becoming a moral controversy of the war. which was a major rail transport and communication centre, housing 110 factories and 50,000 workers in support of the German war effort. Several researchers have claimed that not all of the communications infrastructure, such as the bridges, were targeted, nor were the extensive industrial areas outside the city centre. Large variations in the claimed death toll have fueled the controversy. In March 1945, the German government ordered its press to publish a falsified casualty figure of 200,000 for the Dresden raids, and death toll estimates as high as 500,000 have been given. Although Dresden authorities at the time estimated no more than 25,000 victims, a figure which subsequent investigations as recently as 2010 support. 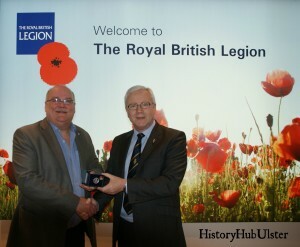 History Hub Ulster member, Nigel Henderson, has been successful in re-uniting a lost Great War Silver War Badge with a living relative of the North Belfast soldier to whom it was awarded. The Silver War Badge was issued to men who were discharged from military service due to war-related injuries or illness. The recipients were required wear the badge on the right lapel to show that they had “done their bit” and would not be regarded as shirkers. Albert Edward Baxter was born around 1884 or 1885 to James Baxter and Agnes Baxter and the family lived at various addresses, Midland Street (Woodvale), Argyle Street (Woodvale), Byron Street (Oldpark) and Harkness Parade (Sydenham). He enlisted into the Royal Engineers (Service Number 57649, 121st Field Company) on 28/11/1914 within four months of war being declared and, after training, was posted to France with the British Expeditionary Force (BEF) on 04/10/1915, where he stayed for just over 1 year. His next posting was back to the Home Service until he was discharged on 24/12/1917 with an unspecified sickness, being awarded Silver War Badge number 295512. Home Service suited Albert, a tailor by trade, as he met Margaret McFarlane and they married on 08/07/1907 in St Anne’s Church, Belfast. Albert died on 16/02/1960 aged 75 and his widow, Margaret, died a couple of months later on 05/04/1960 aged 74. They are both buried in Roselawn. 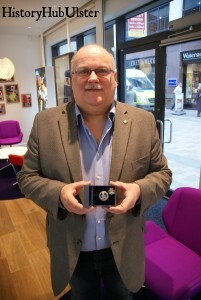 In early 2014, Brian Duffy, Secretary of the Limerick Branch of the Royal British Legion, discovered the Silver War Badge on a militaria stall in the St George’s Street Arcade in Dublin. Realising the badge had been issued to a Belfast man who had served in the Royal Engineers just as his own Dublin grandfather had, he secured it in the hope of reuniting it with the Baxter family. Brian said, “I was browsing in the hope of finding my own grand-fathers lost medals but seeing this badge’s local connection, I believed that it could and should be reunited with Albert Baxter’s family. It was an act of Remembrance really and I posted an appeal on the Facebook page that I administer for the Limerick Branch of the Royal British Legion. Our Belfast following is quite strong and I was confident someone there would be able to help”. History Hub Ulster’s Nigel Henderson, a local Great War researcher, picked up on the post and, having done some additional local research, identified the date on which Albert Baxter died and the names other members of Albert’s family from the death notices in the Belfast newspapers. Nigel posted a request appealing for relatives to come forward on the Belfast Forum and a response was received from Garry Young of Ballybeen in January 2015. Unfortunately, Garry Young was too unwell to meet Brian himself and his grandfather’s Silver War Badge was accepted on his behalf by History Hub Ulster’s Gavin Bamford.